POLSON —Jacob Jr, Jaylynn, Jaidrienn and Jaylene Barker are excited to announce the birth of their brother, Jaisiah Thomas Barker. He was born Jan. 12, 2018, at the Nesting Place in Providence St. Joseph Medical Center. 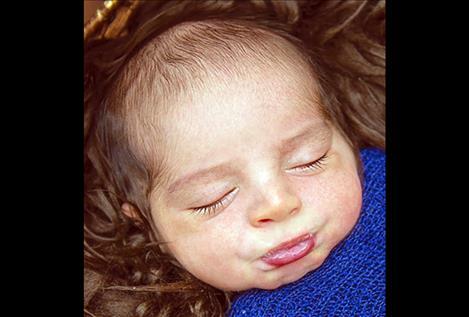 Jaisiah was 19 inches long and weighed 7 pounds, 1 ounce. His parents are Genevieve Hallowell and Jacob Barker. Maternal grandparents are Sandra and Robert Hallowell. Maternal great-grandparent is Augustine Chincarini. Paternal grandparents are Jeanette McCabe and Virgil Barker. Paternal great-grandparents are Andrea and Lester McCabe. POLSON — Audree Lynn Tracy was born Jan. 17, 2018, at the Nesting Place in Providence St. Joseph Medical Center. She was 19 inches long and weighed 5 pounds, 14 ounces. Audree’s parents are Adrianna and Christopher Tracy of Ronan. Maternal grandparent is Lorianne Nelson. Paternal grandparents are Barbara and Douglas Tracy. 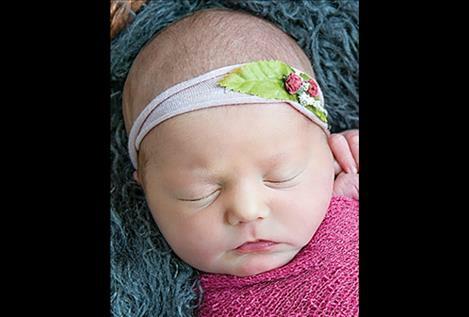 POLSON —Alice and Maxine Cullinan are overjoyed to announce the birth of their sister, Harley Reagan Cullinan. Harley was born Jan. 25, 2018, at the Nesting Place in Providence St. Joseph Medical. 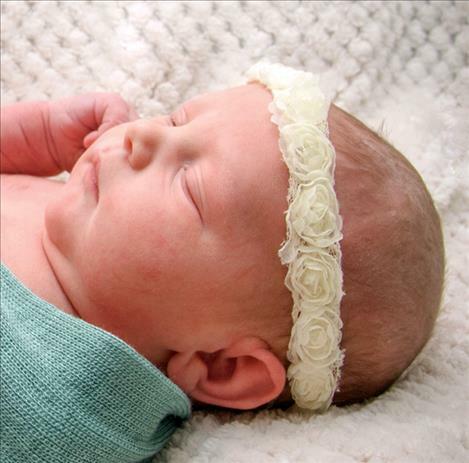 She was 19 inches long and weighed 7 pounds, 7 ounces. Harley’s parents are Courtney Stinger and Benjamin Cullinan of Pablo. Maternal grandparents are Lisa and Guy Stinger. Maternal great-grandparents are Judy Probart Long and Leroy Long. Paternal grandparents are Sandie and Clark Blevins. Paternal great-grandparents are Goldie and Bill Blixt. POLSON — Isabella Rose Charlo-Wynne was born on Sept. 7, 2017, at Providence St. Joseph Medical Center. She weighed 6 pounds. Her proud parents are Charlene Charlo and Douglas Wynne of Ronan. Maternal grandparents are Zelda and Charlie Charlo of Arlee. Paternal grandparents are Cleo Kenmille and Bob Wynne of Ronan. Siblings are Louis Charlo and Payton Mays. POLSON — Payton, Brody and Leighton Shauls announce the birth of Jory Ishmael Mesa. Jory was born Jan. 22, 2018, at the Nesting Place in Providence St. Joseph Medical Center. He was 19 and three quarter inches long and weighed 7 pounds, 7 ounces. His mother is Michelle Mesa of Ronan. Maternal grandparents are Linda Sappington and Chuck Lewis. 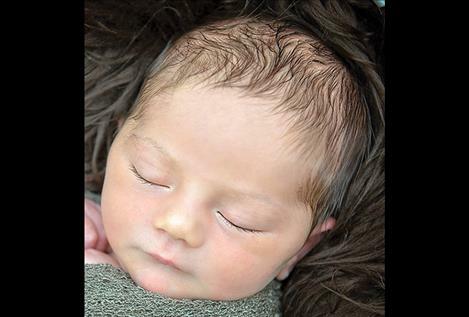 POLSON — Daylin Moran Jr. would like to announce the arrival of brother, Ni’Koda Medicine Horse Moran. Ni’Koda was born Feb. 9, 2018, at the Nesting Place in Providence St. Joseph Medical Center. He was 21 and one-half inches long and weighed 7 pounds, 8 ounces. 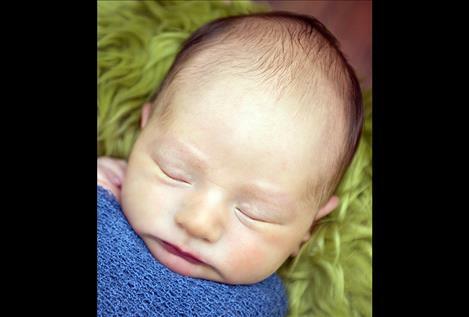 His parents are Alexis Henes and Daylin Moran of Polson. Maternal grandparent is Laurie Ashley Erickson. Paternal grandparents are Alice Moran and Shane Abbot. Paternal great-grandparents are Evelyn and Mike Moran. RONAN — Rylee Annmarie Ferguson was born Feb. 9, 2018, at 9:11 a.m. at St. Luke Community Hospital. 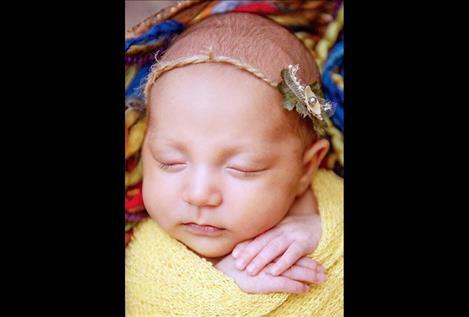 She weighed 7 pounds, 10 ounces and joins siblings Brilyn and Layla. Parents are Brenna Bucholz and Lance Ferguson of Kalispell. Paternal grandparents are Wayne and Rhonda Ferguson of Kalispell. Maternal grandparents are Ron and Carol Bucholz of Charlo. 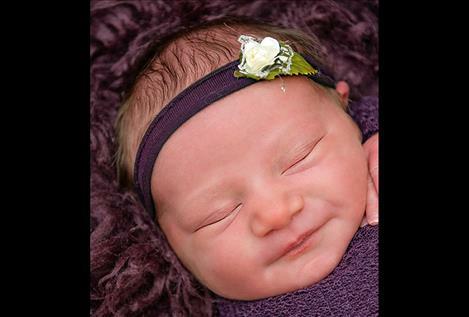 POLSON — Brandy, Tristen, Hailey and Emily are excited to announce the birth of their sister, Sadie Bea Bissegger. 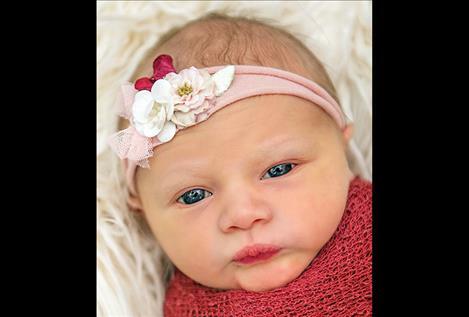 Sadie was born Feb. 4, 2018, at the Nesting Place in Providence St. Joseph Medical Center. She was 20 inches long and weighed 7 pounds, 9 ounces. Sadie’s parents are Jessica Alexander and Brandon Bissegger of Polson. RONAN — Virgil Lee Dennis Mitchell was born Jan. 25, 2018, at St. Luke Community Hospital. 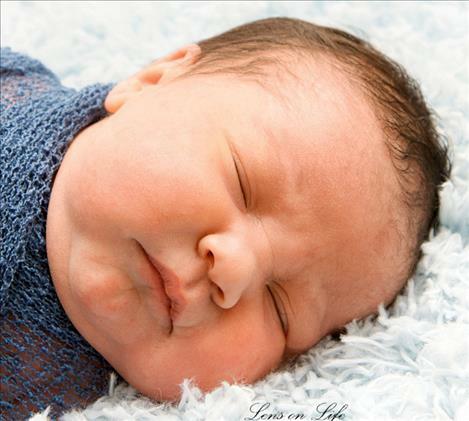 He weighed 5 pounds, 13 ounces and joins brothers Jeremiah, Wyatt and Levi. Parents are Casey and Amanda Mitchell of Missoula. Paternal grandparents are Dennis and Cynthia Mitchell of Polson. Maternal grandparents are Josh and Tanya Coulson of Arlee.